1979 All-Star Red White Blue Player Artpiece - Unautographed. 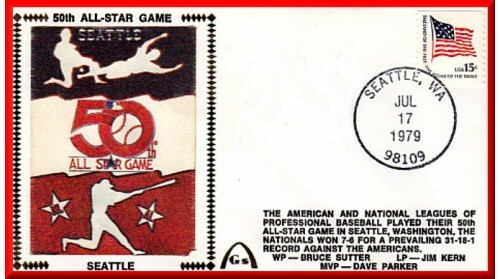 Postmarked July 17, 1979, Seattle, WA - 50th All-Star Game. Sixteen Different Silk Created, Includes 4 Artpiece Designs: Seattle Kingdome, Green Seattle Trees, Green Kingdome Playing Field, Or Red, White And Blue Players. You Choose The Artpiece For Each Autograph, Will Try To Provide It For You: $70--Lasorda/Cey Combo, Lasorda/Lopes Combo $60--Lefty Gomez Or Carl Hubbell: $50--Tom Lasorda Or Joe Morgan,: $35--Pete Rose: $30--Davey Lopes, Gaylord Perry, Jim Rice, Don Baylor, Tommy John, Graig Nettles,Ted Simmons, Or Lou Brock; $20--Dave Kingman Or Chet Lemon: $15--Bruce Bochte, Davey Lopes, Lee Mazzilli, Frank White Or Roy Smalley. We Can Give These Prices Based On Prices Paid For Autographs In 1979-80 Or Early 1990’s. Four National League Players: Mike Schmidt, Ron Cey ‘The “Penguin”, Joaquin Andujar, Bruce Sutter, Dave Parker, And Dave Winfield: And 4 American League Players: Reggie Jackson, Ron Guidry, Bruce Bochte, Darrell Porter, Jim Kern, and Fred Lynn/Carl Yastrzemski/Don Baylor (After Lynn’s Two-Run Homer): Autographs: $50--Reggie Jackson, Mike Schmidt Or Dave Winfield : $30--Ron Guidry Or Ron Cey ‘The “Penguin”: $20--Bruce Bochte: $10--Unautographed . All Artpiece Envelopes Were Printed With The Same Game Information. Each National League & American League Envelope Reflects The Starting Lineups. There Are About 20,000 Large Round Postmarks And About 3,000 Smaller "Bullet" Postmarks. The Smaller "Bullet" Postmarks Were Used Only On The American League Envelopes. Only 2,000 Of Each Silk Were Printed.